We celebrated my babies 2nd Birthday on the weekend – can’t believe he is two already! H had a wonderful time with his cousins and everyone was super surprised when we cut into his Birthday cake to reveal the colours of the rainbow. 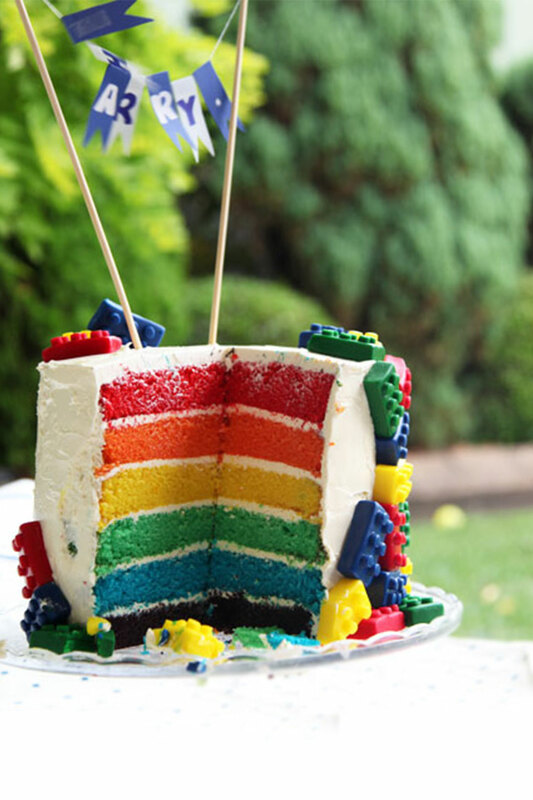 My original idea was to create a checkerboard cake out of the different colour layers, so it would also look like lego on the inside – but I got lazy and went with a rainbow cake instead. Rainbow cakes are surprisingly easy to make, albeit a little time consuming! I have detailed the steps I took to make the cake along with how I made the edible lego. Preheat oven to 180 degrees C (350 degrees F). If making 3 layers at a time, grease 3 cake tins; set aside. Place flour and sugar in a bowl and beat until fluffy. Add vanilla and eggs one at a time. Alternate adding the flour and milk and while beating ending in the flour. Using scales, divide the mixture into 3 bowls. If you don't have scales use a cup to scoop out the mixture, cup at a time into the 3 bowl until it is divided evenly. Add the food colouring for the suitable layer and pour into the greased cake tins. Bake for approximately 30- 40 minutes or until cooked through. Test with a skewer or sharp knife. Cool slightly in the tin and turn out onto a wire rack to cool completely. Repeat steps to make the other 3 layers if necessary. Cut the tops of all the cakes. Place your purple layer on the plate you will serve it on and spread a good layer of the icing over the layer. (you can see from my pictures I didn't use a huge amount of icing in-between each layer) Repeat with all the layers. Then spread a VERY thin layer over the entire cake (called the crumb layer). Fridge the cake now to set all the crumbs in this layer. Once cold the icing will set hard. This makes it a lot easier to ice and prevents you getting crumbs in your icing. Remove from the fridge and add the remaining icing and smooth using a large knife. Roll out the fondant to a thickness of about 12mm (half and inch). Then using a sharp knife cut it into rectangles about 30mm x 15mm (1 1/4 inch by just over 1/2 inch). With the off cuts roll it out so it is a couple of millimetres thick and using a round 7mm plunger cutter (available from baking shops) cut the 6 circle and place on top of the rectangles as you go. Use a little water to moisten the top if they aren't sticking. The lego will stick to the cake icing no problems. If making the cake a day or two ahead of time, keep in the refrigerator unit the day. Bring to room temperature before serving. Please note an Australian cup is based on a 250ml cup. Food colouring for the cake layers: AmeriColor works really well to get the intense colours. I used colours: 106 Electric Blue, 107 Lemon Yellow, 119 Red Red. If buying small bottles I would recommend buying a larger bottle of the red as you will use the most of this colour. Cake colour mixes: Red layer: just pure red. Orange layer: Yellow and Red. Yellow layer: pure yellow. Green layer: Yellow and Blue. Blue layer: Pure blue. Purple layer: Red and Blue - I used to much of both colours and it was too dark. Words cannot express what you mean to me. You are my world. From the moment you came into my life I was totally smitten and love you more and more with each day. I’m so proud of you. This evening you feel asleep on my chest, I know they say its a bad habit to get into, but it is these moments that are so special and that I will remember forever. Your infectious laugh, you are the funniest and happiest person I know, you make me laugh a hundred times a day. You have the most gorgeous smile and dimples that everyone comments on. You are so friendly and everyone knows you in our neighbourhood. You wave and say hi to the barber, the shop assistants and the bus drivers everyday when we go for a walk. The man in the fruit shop always gets a high five, you can’t help but make those around you happy – even complete strangers. Thank you for choosing me to be your mummy. I hope you have a wonderful birthday baby boy. ps: with any luck this blog will still around when you are older and you can browse through and see some of the things we got up to when you were just a little guy. What a pretty colourful cake! Looks like a great celebration…and a ton of delicious food! Thanks very much Lisa. It was a great day, I was probably more excited than H though! The rainbow cake was a huge hit – everyone likes a surprise I guess!